Ruth Gallard Ainsworth was born on 16 Oct 1908 in Manchester, Lancashire, to Rev. Percy Clough Ainsworth and Gertrude Fisk of Pendleton. She was the second of two children, the first being her brother Geoffrey Clough Ainsworth (b. 9 Oct 1905, d. Oct 1998). Tragedy struck the Ainsworth household shortly after Ruth's birth when Percy, a devout minister and rising star in the Methodist Church, died on 1 Jul 1909 from typhoid at the young age of 36. Shortly thereafter the family relocated to 2 High Cliff Villas, Cobbold Road, Felixstowe. At age 15 Ainsworth enrolled at Ipswich High School in Woolverstone where she was a student from Sep 1924 until Jul 1926. On 29 March 1935 she married Frank Lathe Gilbert in Leicester, Leicestershire (she continued using her maiden name as an author's pseudonym). On 7 Sep 1936 she gave birth to twin sons: Christopher Gallard Gilbert (d. Sep 1998, Leeds, Yorkshire) and Oliver Lathe Gilbert (d. May 2005, Sheffield, Yorkshire). 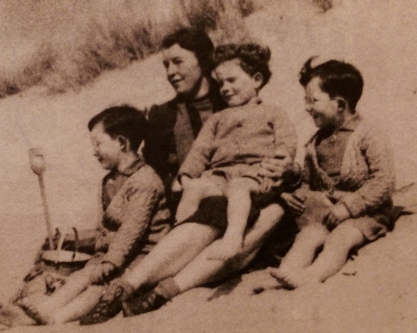 Said Ainsworth of her children: "I made up endless stories as we went on endless walks, often windy and wintry, and they told me stories too." Ainsworth and her family settled in London where their house was destroyed by a bomb attack during the Second World War. The Gilberts then relocated to Porthmadog in northern Wales. During the latter part of Ainsworth's life she and her husband resided in Corbridge, Northumberland: first at West Cheynes, Stagshaw Road and finally at 1 Hippingstones Lane. As her bibliography shows, Ainsworth's literary career began with her first publications in the 1930s and lasted until the early 1980s. In the 1950s Ainsworth was a scriptwriter for the influential children's BBC radio program 'Listen with Mother'. Several of her stories were televised as puppet plays. Ainsworth was an avid reader herself; two of her personal favorite authors were Barbara Pym and Ivy Compton-Burnett. Ainsworth died on 14 May 1984 at the age of 75. Her ashes were scattered in a stream in Wasdale, near Borrowdale in Lake District National Park. "I am told that I began making up poems when I was three, and wrote an exercise book of fairy tales when I was eight. Throughout my childhood I enjoyed writing, whether diaries, school essays or stories. I had a poem in a national daily when I was fifteen, and in my late 'teens there was poetry published in The Spectator, Country Life and other journals. I wrote for a children's magazine which bought my stories for a song. My father died when I was a baby and we moved to a Suffolk backwater. This may be why so many of my stories have a seaside setting. My characters play on the beach as I did, with few other distractions. When I was seventeen we moved to Leicester where there was a good library which added another dimension to life. I won a gold medal for original work and had some poems printed as part of the prize. My first break came when Heinemann published a book of children's poetry, All Different, and I began writing regularly for Listen with Mother. Heinemann published my Listen with Mother Tales which are still in print, and included stories about a little boy called Charles. He kept his treasures in a 'useful bag' and I heard that many children demanded useful bags for themselves. I now had a husband, and three sons to whom I told endless stories. They soon began to tell me wonderful stories, too. Books followed steadily, including a series of eight books about Rufty Tufty the Golliwog, who proved as popular as Charles. He went camping, stayed by the sea, got carried away by a kite, found buried treasure, and had other adventures, accompanied by his friend Rose. It is true that he started school, but in most respects he and Rose stayed about the age of five throughout. I wrote a series of Look Ahead Readers during this period and my only book for adults, poems entitled The Evening Listens, all published by Heinemann. I am still with Heinemann after many years and many books, but I have other publishers, too. There are Puffins, including Lucky Dip, the first Puffin print in I.T.A. I have also worked for Hamish Hamilton, Deutsch, Lutterworth and Bancroft. Once when very young, I sent some manuscripts to an agent who returned them as unsalable, but as I sold them all during the next six months I never had recourse to an agent again. I write in a relaxed position, using a biro [pen]. Later, with less enthusiasm, I type the M.S. rather badly. I bought my first typewriter when I was eighteen and had earned £12. I carried it home in triumph and then spent ages poring over the instruction book, unable even to insert a sheet of paper. I was, and have remained, totally unmechanical. Perhaps this is why Rufty Tufty never visited the moon. My sons maintain that they can recognise much of their own childhood in my stories and now I have seven grandchildren among my readers, including an imaginative six-year-old who fills notebook after notebook with stories and poems. If I live long enough to write stories for my great-grandchildren, I suppose my characters will behave much as they have always done, building sandcastles, making houses, and meaning well, though this sometimes turns out badly. They experience the anguish of separation and disappointment, but there is usually a comforting, solid figure near at hand, and eternal Mrs. Golliwog. Children find magic in the everyday life of play and family. My sources spring from just that. Only children and birds "know the sweetness of cherries, the goodness of bread". Books, especially poetry when I was young, have always been among my purest pleasures. Writing is a pleasure too and I seem to write from a top layer of happiness. If this is lacking, writing becomes more of a routine, less of a joy."